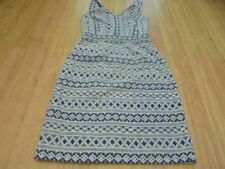 Seasalt Lottie Dress Size 14. 100% Cotton, Fully Lined with 100% Cotton, Comes with spare button attached, 2 side seam pockets, Good condition, From a smoke and pet free home, Any questions please ask, UK only please. Condition is used, but this dress is in immaculate condition. Small mark on dress’ inner lining. The dress is lined and it has a concealed side zip. Gorgeous dress for any occasion and in great condition! Red & White Fit & Flare Dress. Phase Eight. Floral print. 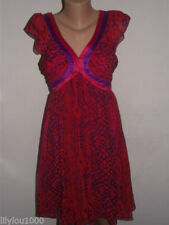 This dress has been worn and washed but is in good condition with no noted defects. zip at side. The dress is lined except for the sleeves. Gorgeous dress for any occasion and RRP price is £39.50! Pull on dress with stretch and no fastenings. Lovely dress by KALEIDOSCOPE. Size UK 20. 95% Polyester 5% Elastane. 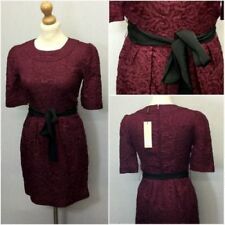 Lovely French Connection dress. the length from the shoulder is approx 34". It has a keyhole neck at the front with a tie at the top of the keyhole. Gorgeous dress for any occasion and RRP price is £39.50! Lovely Monsoon dress. This is a soft stretchy jersey fabric. the length from the shoulder is approx 41 1/2". this is unlined. Gorgeous dress for any occasion and RRP price is £49.50! “Rosa Rosa” Tea Dress, Vintage 50’s Style, Size 16. Condition is Used but only worn a handful of times. Fully lined, full skirt, working buttons to waist, waist belt. Beautiful blue, white and pink flowers on black background. Dispatched with Royal Mail 2nd Class. Absolutely gorgeous dress, wrap round fastening. Very flattering, vintage look. Size 16. Next. 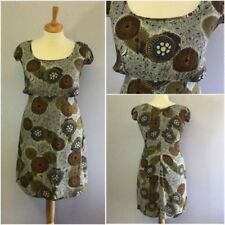 Oasis Ladies Tea Dress Size 12. Condition is Used. Dispatched with Royal Mail 1st Class. Fabulous condition, New without tags Next Smart Summer Shift Dress Size 16 Dusk Rose Pink. Bought to wear for a wedding but weather turned cold and wore something else. Dispatched with Royal Mail 2nd Class. Black main with spread out grey and purple peony flowers. Ladies Cold Shoulder Tea Dress Black Blue Red Floral From F&F Size 20. V neck zip up at the back I'm 5'2" and this fits just above the knee From a smoke free home Condition is Used. Dispatched with Royal Mail 2nd Class. This is a gorgeous dress from Lindy Bop. The outer fabric is green with a floral pattern of different coloured flowers. It can be dressed up or down, looking lovely for the office or a wedding. It is a size 16. Perfect dress for them tricky wedding occasions! TEA DRESS. CROSS OVER V-NECK. ELASTICATED WAIST TO SKIRT WHICH HANGS BEAUTIFULLY. KNEE LENGTH. Cotton feel fabric in a floral print in shades of blue with grey and coral. Dress has a fitted bodice and a full skirt that hangs beautifully. 50s style. Very flattering to wear. It has a back zip and also has a belt although you could wear it without the belt.